Law moves slow — sometimes very slow — and technology moves very fast in comparison. The result is that we often treat new innovations the same way as older tools in the eyes of the law, and that creates some illogical and difficult situations when it comes to law enforcement and justice. In a human rights context, this has played out with export controls in recent years, where the US actually kept people in Iran, Syria, Sudan, and elsewhere from accessing otherwise-ubiquitous services like web browsers and social networks, simply because they couldn’t make a distinction between digital tools and other products when crafting sanctions. It’s a bit like if we had speed limits from the horse-and-buggy age in a world where there are Ferraris. Or, when it comes to video, if we thought about Sony BMC-100Ps from 1993 the same way we think about Google Glass. So it was very encouraging this week to see the US Supreme Court — not the most tech-savvy folks in the world, to say the least — make the case for thinking about smartphones differently. Here’s the situation: The US government argued that your smartphone is just like a scrap of paper, piece of ID, or anything else they may find in your pockets. That means that police have the right to go through your phone just like they have a right to go through your pockets — no warrant needed. The implications of this decision for activists, journalists, and others are clear, and it’s a win for privacy and digital rights. In an ideal world, courts wouldn’t have to pick up the slack for legislators when it comes to these issues and it wouldn’t be so noteworthy when they show flashes of tech competence, but for now let’s hope to see more decisions like this in the future, and not just in the US. 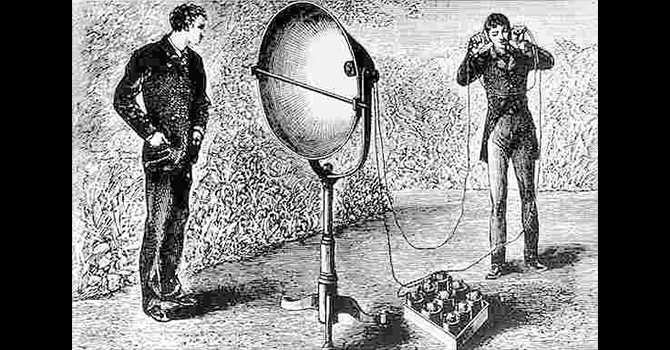 Above image from Wikipedia “Photophony” from Alexander Graham Bell article.